What happens when the polls close? We talked to Maxine, one of the presiding officers in Kirklees, about what happens when the polling stations close at 10pm on Election Day. What’s in the Ballot Box? This afternoon we went along to Huddersfield Town Hall with Andrea to talk to her about the role of the Presiding Officer. Andrea will be managing the polling station in New Street, Milnsbridge tomorrow. This afternoon she has been carefully checking the contents of her ballot boxes and stationery box. Together these boxes contain all the paperwork she’ll need to run her polling station tomorrow – everything from voting papers and signage to the seals that will close the ballot boxes when voting ends at 10pm. If you live in Milnsbridge, she’d really like you to come along and vote tomorrow – even if you turn up to vote at one minute before 10pm (somebody usually does). I bumped into David on the bus home today. He told me that he’s given up on postal voting because for him it’s a bit of a faff, getting the form filled in and having it witnessed. He said that he would “see how he gets on at the polling station” this time instead. David is registered blind, so a standard ballot paper is no good for him. I asked what’s provided at the polling station to make things easier for visually impaired voters. He told me that there’s a template sheet that sits over the top of the ballot paper, with a series of holes corresponding to the spaces where voters can place their X. The boxes are numbered on the sheet, which is tactile so that you can identify where to place your mark. A member of staff at the polling station will read out the options for you, so that you know which candidate corresponds to each number. Then you can be left to cast your vote in private, fold the paper over and take it to the ballot box. Until this chance conversation, I’d never thought about how unsighted people cast their vote on polling day. I know that on the list of polling stations, there’s something to say how accessible each venue is – for example, whether there is a ramp for wheelchair users – but I’ve never really thought about the ballot paper itself. It strikes me that it’s quite easy for most of us to vote, and yet a lot of people don’t bother. At the same time, there are a lot of people who might find the process of voting more difficult, but who always make the effort to use their vote. David also asked me when I thought there might be electronic voting used for the elections in Kirklees. He pointed out that this would create some new options for people with disabilities. As I made the short walk home from the bus stop, I found myself thinking about how elections have evolved over the years. I wonder how the process might change in the future. My first experience of being a reporter was at the Holmfirth Civic Hall. We entered the building through the reception lobby then signed in, we were taken into a large room by the receptionist. At first glance there were many tables with lots of dedicated workers opening piles of envelopes, taking out the voter information and placing them on to another pile by adding a rubber band to keep them in place. The piles would then be taken away by one of the electoral workers who would pass them over to another group of workers on computers; the information would be carefully checked on a computer data system. We met with one of the electoral officers; she had been part of the team for five years. There are seven electoral services staff, responsible for the whole process, including processing all the new applications for postal votes, preparing the information for the voter packs, liaising with the printers, staffing all the polling stations and organising the count. After the polls close on Thursday, ballot boxes are collected from 23 different wards across Kirklees and taken to two counting venues in Huddersfield and Dewsbury – it’s a huge operation. 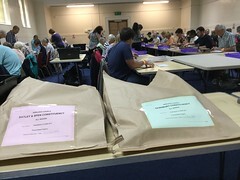 For the opening of the postal votes, the electoral services team are also responsible for writing out to people to get them to come along to help, or “getting bums on seats”, and getting the event set up. 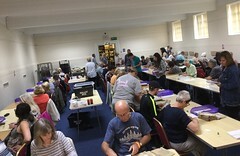 The opening of the postal votes takes several days, with staff staying into the early hours of the morning on Friday to make sure that all the postal votes are verified in time to go through to be counted along with the votes from the polling stations. It was a real eye-opener for us to see how much work goes on behind the scenes. The electoral officer who talked to us on the morning said that their families are used to them not being around much during election week.